After falling into a dreadful nightmare over a year ago, Malaysian martial artist Saiful “The Vampire” Merican has brought back the shimmer to his celebrated prizefighting career with a scintillating victory. In thrilling fashion, Merican trumped Filipino knockout artist Burn “Hitman” Soriano via first-round stoppage in front of his countrymen on the undercard of ONE: THRONE OF TIGERS this past February. 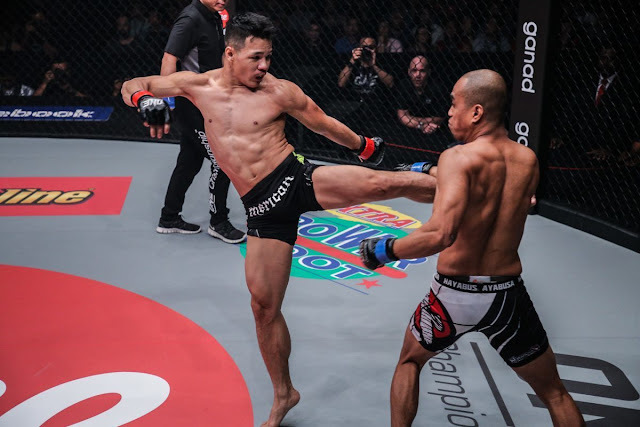 Merican had a calculated attack as he brilliantly picked his shots and rocked Soriano with various perfectly-timed kicks, even backing the Filipino standout up against the renowned ONE Championship cage. Although Soriano was able to put Merican in a precarious position on the mat, the latter managed to find the escape door and shifted the bout’s momentum to his side again. When Soriano attempted to get back up, Merican opened up with his full arsenal as he powerfully kneed his opponent in the chin and threw an array of elbows to conclude the opening salvo. Certainly, the crowd was hyped and ready for the second round, and so was Merican. But Soriano was not as he did not answer the bell, causing the match to be stopped and the win being awarded to the hometown hero to roars of approval from the crowd in attendance. Merican’s impressive conquest of Soriano sparked a much-needed resurgence in his mixed martial arts (MMA) career after yielding to Filipino fighter Geje Eustaquio by way of first-round knockout in January 2016. “I am truly honored to get that win in front of my compatriots. It’s a sigh of relief because I wanted that victory so bad. My back was against the wall. I proved that I could make a comeback. It’s a new beginning for me,” said Merican, who opted to sit on the sidelines following his setback to Eustaquio. “I’ve worked to be in this position again. I am not letting go. I am excited to be in this new journey. I hope everything will turn our great for me in the future,” he added. His next act will be on 5 August when he clashes with Chinese combatant “Rock Man” Chen Lei at ONE: KINGS & CONQUERORS, which takes place at the glamorous Cotai Arena of The Venetian Macao in Macao, China. The 28-year-old native of Kuala Lumpur, Malaysia stressed that he is looking to add another finish to his growing highlight-reel. Seeking to prove that his martial arts renaissance is not only good for one night, Merican aims to showcase his explosive fighting style once more versus his Chinese foe.